there are bugs in your Starbucks Strawberry Frappuccinos! The red coloring in them in made from the female cochineal beetles. That's right, crushed bugs! Carminic acid is extracted from the crushed bugs to make dye. Cochineal extract aka natural red 4, carmine, cohineal, crimson lake, C.I. 75470 or E120. It's nothing new. It has been used for ages in foods such as Tropicana's Ruby Red Grapefruit Juice and Ben and Jerry's Cherry Garcia Ice Cream and is safe to use. Read your labels. Beware of "natural color" if your are avoiding cochineal extract. It doesn't stop there! It is used widely in many cosmetics. Your lipstick may get it's pretty red color from bugs! You don't want bug extract in your makeup? Read your labels! You can also buy vegan cosmetics to be sure there is no bug juice! To find vegan cosmetics, go to caringconsumer.com. Go to cruelty free companies by product type, choose cosmetics and look for the vegan brands. Q. I have a split that runs from my cuticle to the tip of my nail. It's always there and the split opens more as the nail gets longer. Why won't it heal? A. The matrix, the area on the finger where the nail is formed, suffered an injury at some point in time and was damaged in the process. The nail is now is formed with the split defect. It will not heal. Have your nail tech apply a nail wrap or an acrylic or gel overlay to cover the split and hold it together. You will always need keep the nail covered to hide the split and to keep the split together. 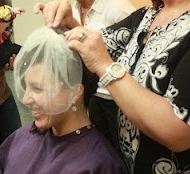 All of us at the salon were really excited about today's wedding party. 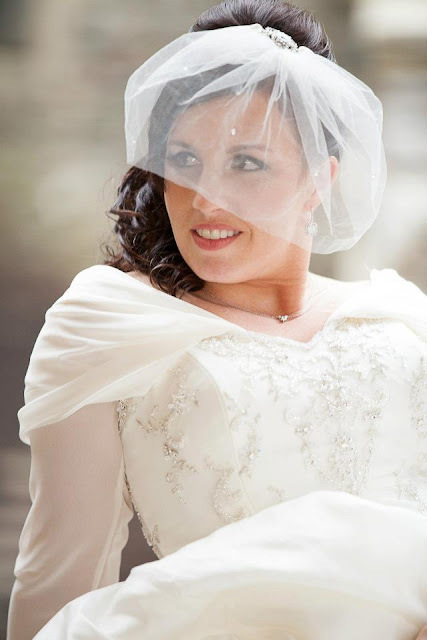 The bride was one of our own so we couldn't wait to pamper her and make her gorgeous! 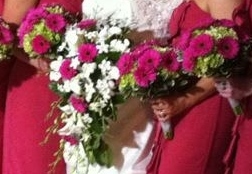 The bridesmaids were wearing a beautiful deep pink for this early spring wedding. The day was a little gray and bit chilly, but the salon was bright, warm and buzzing. 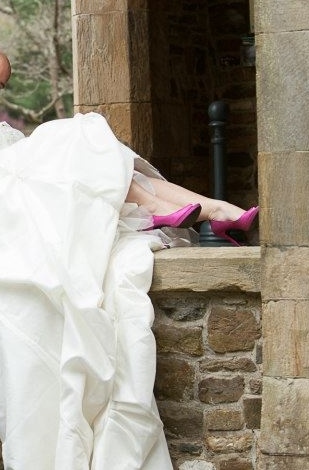 Wedding day can be a little chaotic! Click here to watch us get everyone ready! We did some glamorous makeup with lots of focus on her eyes. 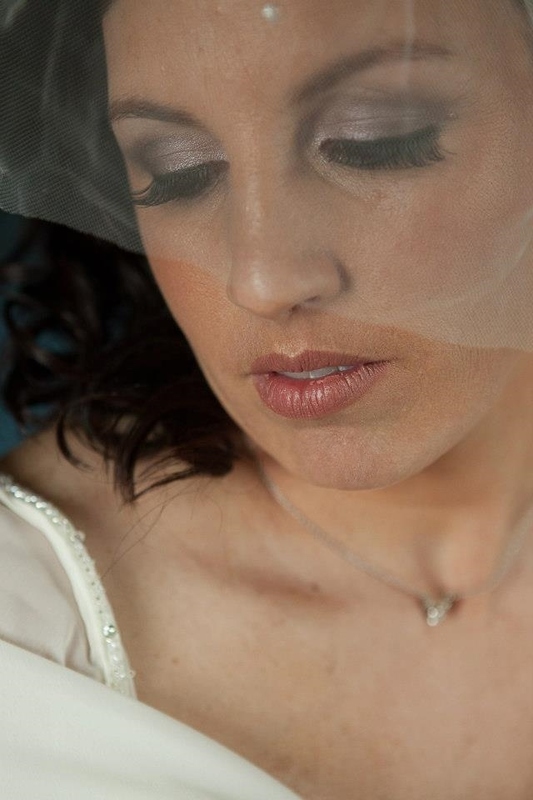 For her eye shadow, we did shades of white, silver and gray. I used black liner, strip lashes and defined her brows with brow powder. A soft pink shimmer lipstick and pink blush gave her a soft pink look to coordinate with her pink theme. Look at her! Absolutely gorgeous!!! look at her shoes. Love it! She had her beauty team with her all day long for hair and makeup touch up. She looked picture perfect the entire day. Q. Can I get a toe nail fungus when I have a pedicure done at a salon or spa? A. You can get a toenail fungus when having a pedicure if the foot bath or tools being used on you are contaminated with the fungus and if you have an opening in the skin around the toenail for the fungus to enter in. The whirlpool baths used in many salon and spas may not be cleaned and disinfected properly. Be sure to go to a reputable, licensed salon or spa that is willing to explain how the whirlpools are cleaned. You want to hear that they clean not only the basin, but also the inner pipes frequently. Also, look for a salon or spa the uses foot bath pedicure basins with disposable liners, disposable orangewood sticks and disposable nail and foot files. That way your are guaranteed a fresh clean pedicure. See me at the salon for a super clean pedicure! I'm not a big fan of orange. It just doesn't look that good on me, but it's all the rage! I want the look, but I don't want to pay a lot for it since I won't be wearing it often. I found Wet n Wild Mega Last Lipstick in 24 Carrot Gold. It's long wearing. Has a semi matte finish. And is about $3.00. Perfect! I love beautiful shiny, long wearing nail polish but, I have always resisted using any nail application that required the use of a UV light. As an esthetician, it has always been my opinion that exposure to these UV lights could damage the skin on the hands causing aging and skin cancer. The "experts'" claimed the exposure was so minimal that it would not cause damage to the skin. Popular gel polishes, such as Shellac, require UV light to cure the polish in minutes. Well, guess what? Dermatologists are now recommending, if you absolutely cannot live without your gel polish, that sunscreen be applied to the hands before they go under the light. Yesterday morning on the Good Day, a dermatologist recommended wearing gloves with the finger tips cut off before putting your hands under the light. This dermatologist also had concerns with the methacrylate in the polish and the soaking of the nails in acetone to remove the gel polish. I recommend using regular old nail polish. 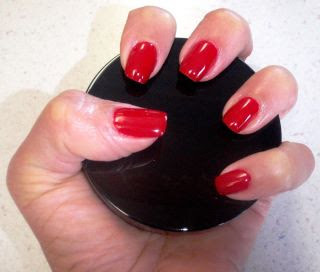 Have your nail technician apply an adhesive base coat, polish and a good top coat. At home, you can add additional coat of top coat every day or every other day to extend polish wear and keep it super glossy. Many brands are making hybrid nail polishes now. These are polishes that remove like regular polish but look gel polish. They also last longer than regular nail polish. Try OPI Infinite Shine or CND Vinylux.